Clinician: Vocalist, Keyboardist, Songwriter: Mary Durst was born in Michigan where she grew up performing classical & gospel music with her family. In High School she began doing solo shows & gigs. She studied classical music at Spring Arbor University, Huntington University, Azusa Pacific University and Jazz at Cal Poly University where she also toured with jazz fusion and gospel bands. Her songwriting career landed her songs in the top 40 smooth jazz charts in 2001 and 2006. She has written 100’s of worship songs being used in churches today as well as her commercial music used in television & movies. Mary has taught music for over 34 years and has been on faculty at Pasadena City College teaching Studio Jazz Voice and combo band since 2006. She works studio gigs and performs weekly with the 2AZZ1 band. Clinician: Saxophonist: Craig Durst was born in Michigan. He graduated from Interlochen Arts Academy High School. He then studied classical saxophone at the University of Michigan and then included jazz studies at Azusa Pacific University. He also studied with LA’s legend jazz educator Charlie Shoemake which launched him into the jazz world as a highly acclaimed saxophonist. Craig is also a studio audio engineer and not only has produced 100’s of music projects but he has engineered audio for television shows such as Good Housekeeping series and voice over works which included artists such as Isaiah Washington (Grey’s Anatomy) and William Sanderson (Deadwood). He has taught music for over 34 years including a residency teaching saxophone ensemble at Mt San Antonio College. Craig performed with The Temptations recently and currently performs weekly with the 2AZZ1 band and other artists besides his ongoing studio work. 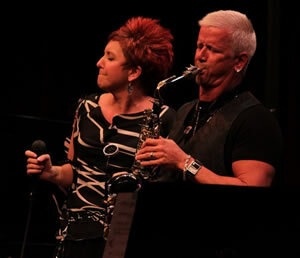 Together Craig and Mary have recorded numerous albums of their own original works & arrangements. They now bring that music, years of experience, performance skills and teaching to students and their directors. Their powerful combination of instruction, encouragement and guidance to rhythm sections & horn ensemble players is fun, enlightening and unprecedented. Young musicians and band directors are digging the high energy, fresh and new sounds of their original music that was arranged by Bill Fulton for High School level big bands. "I met Craig and Mary Durst in the early 90's as they were teaching some of our Lone Hill Middle School music students. They are excellent musicians and students respond well to their instruction and performances. I recommend them heartily and look forward to hearing their recent project." "Craig and Mary have an amazing and unique way of both entertaining AND educating every student that they encounter. Their knowledge of music performance and theory is surpassed only by the way in which they impart it."